Relishes tend to be half way between a chutney and a pickle in that, though they use the same kinds of fruits and vegetables, the finished texture is different. The fruit or vegetables are cut into small pieces or coarsely chopped and a combination of spices and flavourings are used to make them sweet, sour, spiced or more on the plain side. The preservative is, of course, vinegar. Not all relishes require cooking and, those that do, take a shorter time than chutneys so that the ingredients keep their shape. This makes them quick and easy to make..
A stainless steel or enamel-lined pan that is large enough to contain all the ingredients (if you’re also a big jam maker it may be well worth in investing in a preserving pan). Brass, copper or iron pans should not be used as they react with the vinegar and give a metallic flavour to the relish. Heatproof jug or wide necked stainless steel funnel – a heatproof glass, stainless steel or enamel jug is useful for pouring the chutney into the jars. Alternatively a wide necked stainless steel funnel or a large ladle can be used. Muslin or cotton squares – to tie up whole spices wanted for flavourings. Scales – preferably dual marked in metric and imperial. Chopping boards and stainless steel knife. 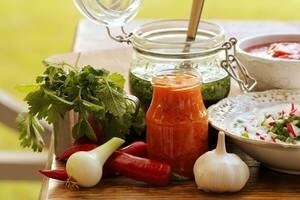 Jars – use small jars that are clean, dry and sterilized. To sterilize the jars just before filling, put into a cool oven, Gas Mark 1 (140°C/275°F), for a few minutes. Covers – these are most important. Vinegar corrodes metal, so use plastic screw or snap-on type or plastic preserving skin. Specialist preserving or bottling jars are suitable, either with screw-on or clip-on lid, providing the lid is made of glass. Labels – For the front of the jars to identify the relish and the date made. Again follow the recipe but, where not specified, demerara sugar tends to work best. Not all relishes require the addition of sugar. This must be of good quality and have an acetic content of at least 5%. Malt, white or wine vinegar can be used. Follow the recipe, some call for tying whole spices in muslin whilst others are added direct. Relishes are very versatile. Some are great with cold meats, salads and cheeses. They can be added to casseroles, sauces and marinades or used as an accompaniment to curry.